Turn the ignition switch to ON (II), and make sure to turn the A/C switch OFF, then turn the ignition switch to LOCK (0). 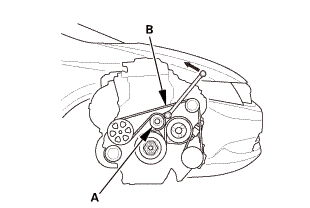 Check the position of the auto-tensioner indicator pointer (A). Start the engine, then check the position again with the engine idling. If the position of the indicator moves or fluctuates a lot, replace the auto-tensioner. 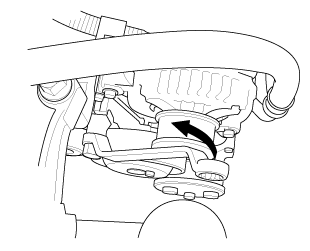 Check for abnormal noise from the tensioner pulley. If you hear any abnormal noise, replace the auto-tensioner. 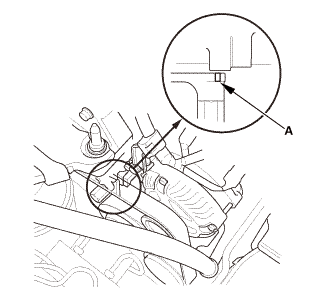 Set a long-handled, boxed-end wrench on the drive belt auto-tensioner from above the engine. Slowly turn the wrench in the direction of the arrow. Check that the auto-tensioner moves smoothly and without any abnormal noise. If the auto-tensioner does not move smoothly, or you hear any abnormal noise, replace the auto-tensioner. NOTE: This is a hydraulic type auto-tensioner; you must turn the wrench slowly.